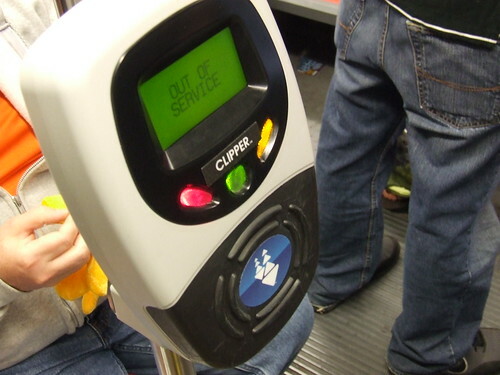 SF Appeal and the Examiner posted reports about the Clipper card being being used for a pilot program to pay for certain San Francisco MTA owned garages at the following locations: Mission-Bartlett, Japan Center, North Beach, Performing Arts, and Vallejo. It sounds like a great idea, extend the usage of the electronic fare card beyond public transit to pay for other items like parking lots, street meters, and maybe even your Slurpees and nachos. But here lies the problem... I can easily forecast a major legal issue Clipper, the Metropolitan Transportation Commission, and the SFMTA must resolve prior to starting this program: Commuter benefit programs. You might be familiar with commuter benefit programs, the employer enrolls with a commuter benefit company to issue out passes, vouchers, and debit cards for the employee to take public transit or use designated parking lots that would provide a pre-taxed savings that could save a person up to 40% (average is 20%). Depending on a person's salary and how much is needed to pay for transit and/or parking, the savings can be significant. Clipper's e-cash, e-tickets, and e-passes can be purchased using commuter benefits programs. They can be automatically added on a monthly basis, submit a paper voucher to designated in-person add value locations, and debit cards can be used at transit agency ticket offices, Clippercard.com, and automated add value machines. It is my understanding of the commuter benefit programs that there are some restrictions on the proper usage of the funds. One detail I have learned is Clipper is not legally allowed to issue cash refunds to those passengers who cancels their Clipper card and if ever their card e-cash funds was paid with commuter benefits (just a penny in the e-cash purse from commuter benefits voids the right to a refund). Commuter benefits can pay for parking as long as "parking at or near your work location or at or near a location from which you commute by car pool, commuter highway vehicle or mass transit" (ASI Flex). It brings up a big question, can pre-taxed funds on a Clipper card be legally used for parking in San Francisco's garages? That really depends... yes, a person who commutes to and from work and pays for their parking with commuter benefits are entitled to it, but how about those who uses the lots for a leisurely purpose, like paying the J-Town lot so the person can see a movie at Sundance Kabuki? I have never heard of the SFMTA allowing their parking meter cards to be paid with commuter benefit vouchers, so how can a Clipper card funded with commuter benefits be allowed to pay for the garages? Also, how can the system tell if a passenger is using it for a lawful purpose (parking to go to work) versus a non-commute purpose? Clipper's potential could be extended to even more usage beyond public transit and parking, say purchasing groceries or buying a burger at a fast food restaurant. The Octopus card in Hong Kong has grown so successful, you can buy food at McDonald's, get groceries, buy baked goods, and other unique products and services that are not transit or parking related. This brings up a new legal challenge for Clipper... commuter benefit programs cannot pay for anything other than transit and parking. It would likely be if items were to be purchased from a Clipper account, it would come directly from the e-cash purse. E-cash is the term used for the universal electronic funds that currently pays the fares for transit if a passenger does not have a valid pass. Also, the source of funding for the e-cash purse can come from two ways, paid directly from the customer or paid in pre-taxed commuter benefits. By funding e-cash with pre-taxed commuter benefits, it makes the e-cash fund toxic and restricts the Clipper user's right to only use the card to pay for transit and parking. Just like I mentioned earlier, once the e-cash purse is funded with just a cent of commuter benefits, a passenger is not entitled to a refund if they cancel their card. If my analysis is true and correct, there will have to be a solution in place prior to the start of the SFMTA parking garage pilot program. For those who funds their e-cash purse with transit benefits (assuming Clipper does not want to issue two cards: one for lawful transit purposes and the other for pleasure), there may need to be more than one e-cash purse maintained in the account. One purse would be used for commuter benefits funds while the general e-cash purse is funded through a person's out-of-pocket expenses. When riding transit, the commuter benefits purse is used first, and when depleted, the general e-cash purse is used. But what to do with the commuter benefit funds right now? Many people have an e-cash purse that is mixed with both out-of-pocket cash and commuter benefits. If Clipper has to create two purses, how will they sort-out the mixed e-cash purse issue? They already have to address this today for cases where someone has a High-Value BART purse and a regular e-cash purse. The issue may not be the logic but memory on the card. Anonymous #2: Says who? MTC, Feds? And please identify yourself if you are an official. Any thoughts on why they wont accept American Express to add or buy passes on the Clipper? What's to stop me from buying a monthly Caltrain pass for "work" using Commuter Benefits and riding it on the weekend for fun? What if I take the train past my stop (22nd Street) and ride it all the way to 4th and King, just to meet a friend for dinner? Is this really such a big deal?